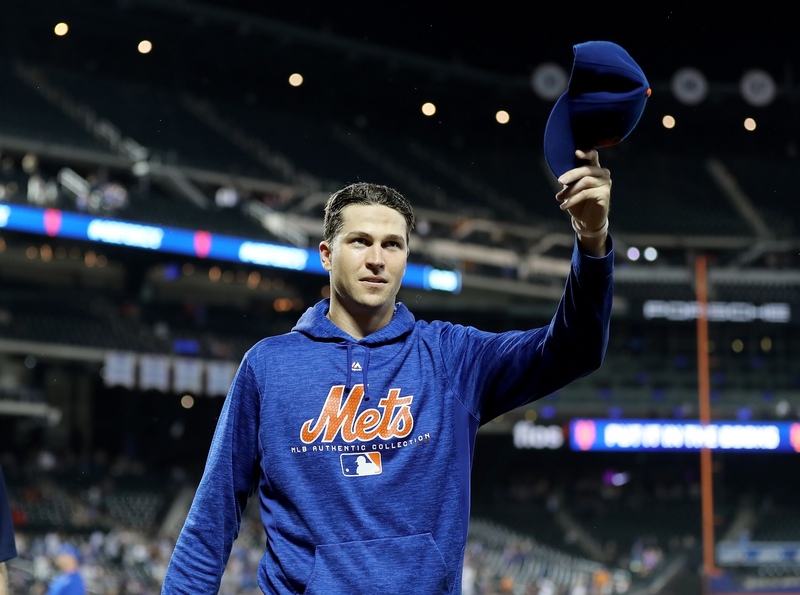 After some pretty impressive offseason signings by the New York Mets, the most important issue for the Mets has been signing Jacob deGrom to an extension. There are no solid reports about what the Mets are willing to offer or what deGrom’s agents have asked for, however, negotiations have become contentious with the ace pitchers agent hinting that the ace pitcher could enact innings limits and by cutting off negotiations on Opening Day. The following are cases for extending deGrom immediately and for waiting until after the 2019 season. First and foremost, Jacob deGrom is under contract for two more seasons. deGrom received a raise this season; he will receive $10 million more this year than last year in an agreement he signed to avoid arbitration. If he remains unsigned after this season, he will likely receive north of $20 million in a similar deal or in arbitration. deGrom had an historically amazing year, this is true. This is exactly the reason the Mets should be careful rushing into an extension. Because of the remarkable season deGrom just had, his stock is at an all time high. From a business standpoint, this would be the worst time to sign deGrom. The chances that he could match a 1.70 ERA are next to zero. The Mets would likely come out better after another season, rather than off the emotional high of a Cy Young winning season. Honestly, the Mets would have been better off extending deGrom’s contract before the beginning of last season. There is also the issue of deGrom’s age. He’s 30 now, he will be 32 by the time he is no longer under contract with the Mets. If he wants a contract that extends him four years beyond then, he will be 36 years old. Then the question becomes what is a 36-year-old pitcher worth? Should the Mets be paying north of $25 million a year for a 36-year-old pitcher six years from now? Contracts are complicated, beyond the per year money and the number of years, there are also the issues of potential player opt-outs, team opt-outs, incentives, no-trade clauses and various other issues. It might well be best to wait until after the 2019 season to have the time necessary to negotiate a contract best for both deGrom and the Mets. In a season that was mostly a disappointment, Jacob deGrom made the Mets appointment television every fifth day. While the Mets were horrible at providing run support for deGrom, watching him pitch, regardless of whether the Mets won or lost, was always incredible. He finished his historic season with another tremendous start shutting out the division-leading and historic Mets rival, Atlanta Braves 3-0. He allowed only 2 hits over 8 innings and striking out 10 batters. He lowered his already historically low 1.77 ERA to finish the season at 1.70.
deGrom has played for the Mets since he was called up in 2014. In that time he has earned two All-Star Game appearances and the Cy Young award last season. (He also finished fifth in MVP voting. In 2017, another disappointing year for the Mets, he won 15 games and he won 14 games in 2015, the year that Mets went to the World Series. Beyond the statistics, however, come the intangibles, which deGrom possesses in spades. He is the quintessential professional. He gives everything he has on the field every time, he has never had a single negative incident off the field and he is universally admired in the clubhouse. Frankly, he’s exactly the person any team would dream of as the ace of their pitching staff. Gregg Giannotti on the WFAN Morning Show with Boomer and Gio, brought up another positive that’s not always mentioned. He pointed out that deGrom has already had Tommy John surgery in October 2010, a surgery that is rarely needed twice. He also pointed out that deGrom wasn’t always a pitcher, in high school and at Stetson University, deGrom was an infielder, playing mostly at shortstop. He didn’t start pitching at Stetson until 2010, so his arm doesn’t have quite as many miles on it as most pitchers his age. The Mets are at an interesting crossroads. They had a very strong start and an extremely disappointing finish; new general manager Brodie Van Wagenen has injected new life into the franchise. The bullpen looks, on paper, to be the best that it has been in more than a decade, Wilson Ramos provides a legitimate bat and glove at the catcher position and the depth at both infield and outfield has been greatly improved. This is exactly the time the Mets need to solidify the pitching staff, starting with extending the contract of the best pitcher the Mets have had since Dwight Gooden.